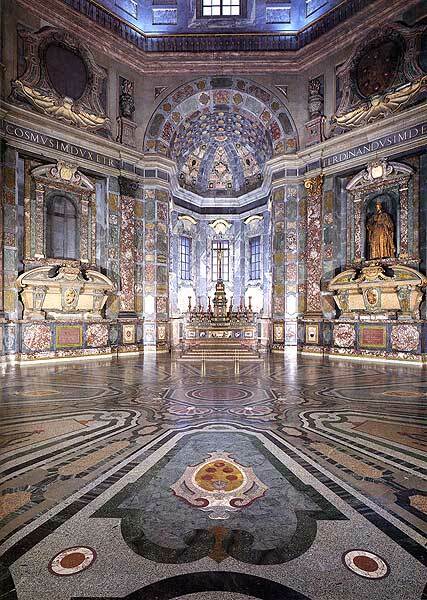 The Medici Chapels form part of a monumental complex developed over almost two centuries to serve as a proper family mausoleum for the Medici family. Michelangelo began working on the structure around 1520, and until 1533 he worked on the sculptures that wonld have decorated the walls and the sarcophagi. The only ones actually completed were the statues of Lorenzo Duke of Urbino and of Giuliano Duke of Nemours, in addition to the allegories of Day and Nitgh, Dawn and Dusk, and the group representing the Madonna with child flanked by Saints Cosma and Damiano (protectors of the Medici), executed respectively by Montorsoli and Baccio da Montelupo, both pupils of Buonarroti. The Museum is especially famous for the New Sacristy which Michelangelo designed for the tombs of Lorenzo and Giuliano de' Medici, creating one of the masterpieces of architecture and sculpture of the Italian Renaissance. The Chapel of the Princes was begun in the early 17th century to become the mausoleum of the Medici grand-dukes. This grandiose octagonal chapel, with its immense dome, is entirely faced with polychrome marble and pietre dure. The museum is open daily from 8:15-13:50.